It's almost ready to go to press, folks! Deacon Millett is teaching a workshop based on this new book at the MISC Workshops in Forestville, California, May 4-5, 2013, and all attendees of his class will get a FREE copy of the book and a spell that they will make. What a wonderful suprise. I can't wait to get a copy of this one. I'm very happy to see Deacon Millet's name on a publication! Hopefully what will be the first of many...or at least a few! I will gladly get this book as soon as it is available. In this brand-new book, Deacon Millett of Four Altars Gospel Sanctuary presents full, complete, and authentic instructions on every kind of sugar, honey, apple, onion, molasses, and syrup spell you can imaging. Deacon Millett is a Reconciliation and Love Spell specialist, and the incredible opening section filled with the Deacon's recipes for making your own sugar scrubs, sweet bowl spells, and honey baths! Plus, he has included an extensive "Frequently Asked Questions" section, gleaned from the pages of the Lucky Mojo Forum -- with incredible answers by our intrepid moderators and members of the Association of Independent Readers and Rootworkers. Trust me, after this book comes out, the information you have always wanted will be available in one easy-to-read compendium. 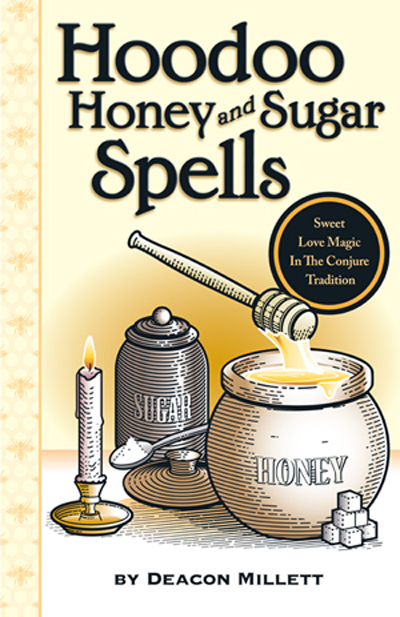 Deacon Millett is teaching a Honey and Sugar Spells workshop based on this new book at the MISC Workshops in Forestville, California, May 4-5, 2013, and all attendees of his class will get a FREE copy of the book and a spell that they will make. If you live in California, this event, the kick-off for this soon-to-be-a-classic book, is something to put on your calendar. Deacon Millett will be signing books, of course, and we will be having an all-around party as well. Come on out and walk the newly installed labyrinth, get your free copy of The Black Folder (everyone gets one! ), and take home Deacon Millett's contribution to hoodoo knowledge. This fantastic compendium of sweet, good magic goes on sale to the general public on May 6th, 2013 -- and at $9.00 for 96 jam-packed pages, this one is a classic for the ages! I absolutely ADORE this book!! It's so inspiring, thought-provoking, and it gets my creative juices flowing like the Mississippi River!! I especially enjoy how intelligently informative it is, and the RECIPES are positively delectable. With this handy book by my side, I will never have another sour person in my life again! Lol!! As my Granny would say, "Boy....you put yo foot in this! "; and the Frequently Asked Questions section was a very nice touch. You even get a chuckle out of some of the questions. I give this book 5 GOLD STARS, and you have my permission to post that anywhere you want! I just ordered my copy from Lucky Mojo tonight. I can't wait to receive it and pour over it. Well done, sir! hi everyone, I purchased the honey hoodoo & sugar spells book. I re-rinsed and used a body wash again for smell, but when I poured that stuff on myself it stung n felt like it was a burning sensation on my throat..
any thoughts anyone as to why this happened? im going to continue doing this for 5 days in total. we'll see if I get that same burning tonight or burning any place else on my body. just want to know if anybody had ant ideas why I felt that burning?? Thank You St. Barbara for all of you protection and help. Thank you St Martha for all your help. You probably did not DILUTE it in enough water. Making a bath means adding a lot of water to it! Thank You Miss Cat the recipe calls for 4 cups of warm water. I cannot wait to buy this book! As soon as my current order arrives, I'll be placing another one and you can be SURE this will be on it! I've been following Deacon Millet's work online and I am very happy that he has published this! Looking forward to more as I know it'll be great! Petition papers, herbs, and prayers cannot hurt the spell. I agree -- it a great book -- and so popular that the first printing has SOLD OUT and we are now at press with the SECOND PRINTING! You can definitely dilute it in a gallon and then put it in our bathtub. I made a honey jar using information from this book to sweeten my lover to want to see me more often. He's been driving a 3 hour round trip to see me more often and even commented today on how he can't get enough of me. I used a petition paper wrapped around our hairs and herbs and have been burning a red candle on top 3x a week. It didn't take long for the spell to work. I highly recommend the book!! I just have to say this book is simply amazing. It was next on my personal reading list and when I started it I couldn't put it down! Many of the niggling questions I've had in the back of my mind have been answered and I have been truly inspired. If anyone has been on the fence about this book it's definitely time to add it to your library. Invaluable information, well presented, thoroughly enjoyable. I don't remember the last time I devoured a book like this...! I definitely recommend this book. I hope more people are giving it a try. It's actually cheaper than a kit, and will help you understand why and how honey and sugar spells work. You won't, for example, make the mistake of dumping Intranquil Spirit in your jar and burning a Santa Muerte candle on top of it. (Ok, I'm exaggerating, but you get the idea). I'm a very "head" kind of person, so this helped me, but the actual spells are simple, collected from lots of different sources, and contains some good forum advice, too. So if you are ordering a honey jar kit to do anything, it's worth the extra 9.00 for the advice and help. Thanks for your kind review. "Hoodoo Honey and Sugar Spells" is one of our best-selling titles, and we are very happy that it has found a respected place in many a magician's library.